I grew up in the Fort Lauderdale area, so when I found out that the Cruise360 annual conference was being held there in April 2018, I was so excited! I was also looking forward to the privilege of staying in a hotel right on the intracoastal waterway. 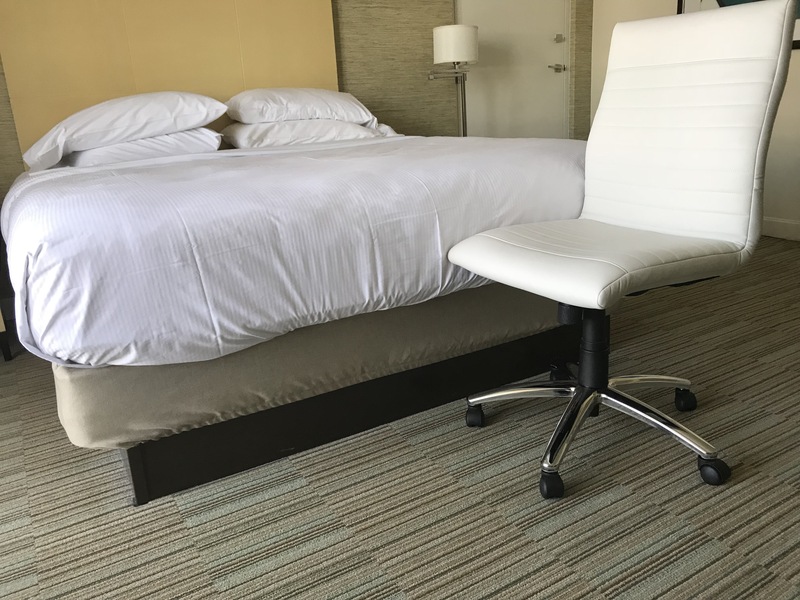 I booked an accessible room at the Hilton Fort Lauderdale Marina because it was one of the official conference hotels right across from the Broward County Convention Center nearby. This Hilton was built in 1980 and has been renovated several times. However, the property shows its age, and this has impacted the Hilton’s wheelchair accessibility. Due to this, and some very negative interactions with a manager, this was one of my worst hotel stays as a full-time wheelchair user. I was assigned a wheelchair accessible room with a roll-in shower and king bed on the bottom floor. 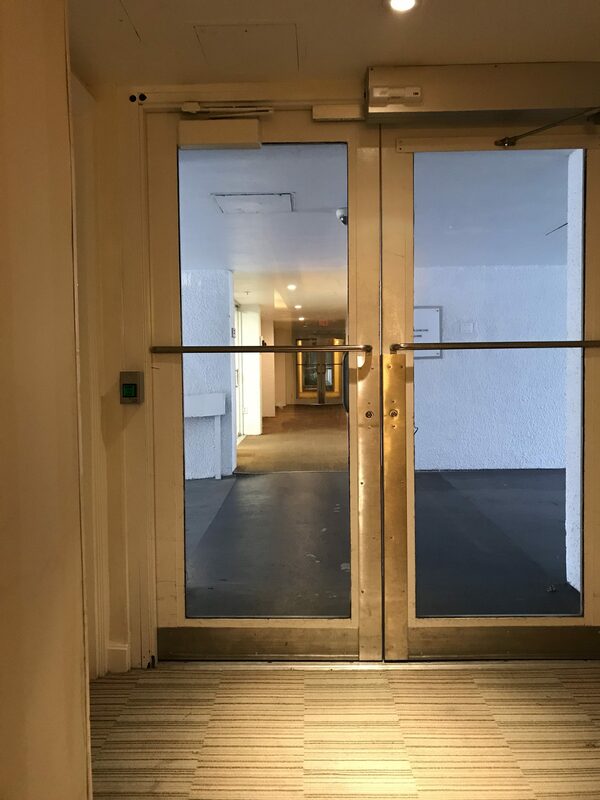 However, the room was located at the other end of the property from the lobby, and to reach it I had to go through two sets of automatic sliding doors and three sets of non-automatic heavy glass doors. These would have been very difficult for a manual wheelchair user to open and get through. The outdoor grill/restaurant by the pool was accessible, although the pool itself did not have a lift. The sidewalks on and around the property are in good repair. The room itself was very large with plenty of space around the bed and a large bathroom. However, the large balcony was inaccessible due to a tall metal lip. The sink was not a true roll-under sink, and my knees bumped into the wood cabinet over the pipes. 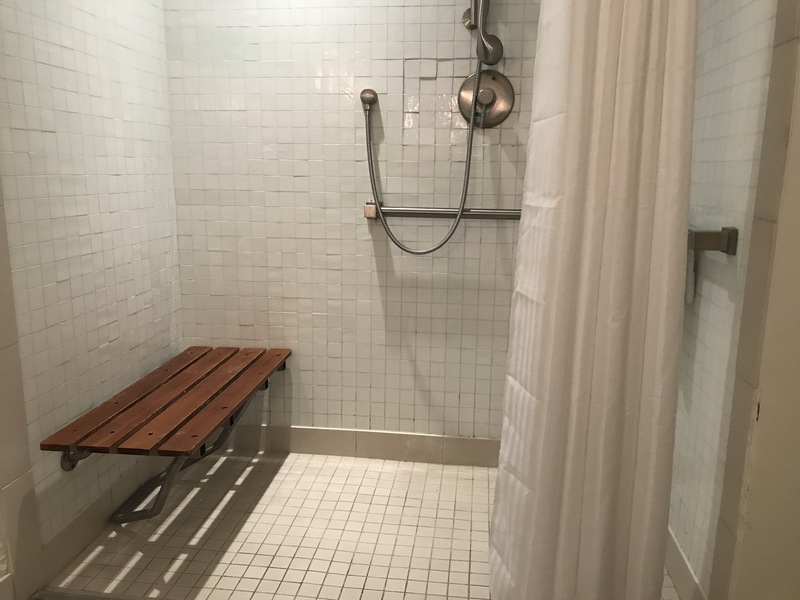 The shower had a wooden fold-down bench and the controls were reachable. However, the bench was placed too low on the wall and it was very difficult for me to transfer back to my chair from the bench. The height of the bed, for me, made it unusable. Technically, the height of hotel room beds is not mandated by the ADA. Many wheelchair users (like me) prefer a lower bed for ease of transfer, but some need a higher bed – especially if they need space underneath to fit a hoist. As I’ve done before at other hotels, I called the front desk and asked for someone from maintenance to come to the room and lower the bed. For one hour, I heard nothing. I called the front desk again, and she said she would contact maintenance again. After an additional 45 minutes of not hearing anything, I went to the front desk and asked to speak to the manager. I explained to the manager that I could not get into my bed, and asked him to help me come up with a solution. He said that maintenance explained to him that there was no way to lower the bed because the box spring was attached to the platform underneath it. No one bothered to communicate this information to me. I asked if they could bring a rollaway bed into my room, and he said the hotel had none. I asked if he could get a rollaway bed from another Hilton property, and he said no. He suggested I move to another hotel, and he would refund me the deposit I had already paid here at the Hilton if I had to leave. However, he said he would not compensate me for any part of my stay if I was forced to stay at the Hilton. At no time did anyone from maintenance or the manager actually come to my room or offer any solutions. The manager said he had been working at this hotel for several months and no one had ever complained. This angered me because it was condescending and made me feel like my concerns were not valid since no one else had complained before me. At the end of the conversation, I explained to the manager that in addition to being a travel agent, I was also an accessible travel blogger, and I gave him a heads up that as I do with every hotel I stay in, I would be writing a review for my blog. That review would be negative and it would reflect everything that happened. 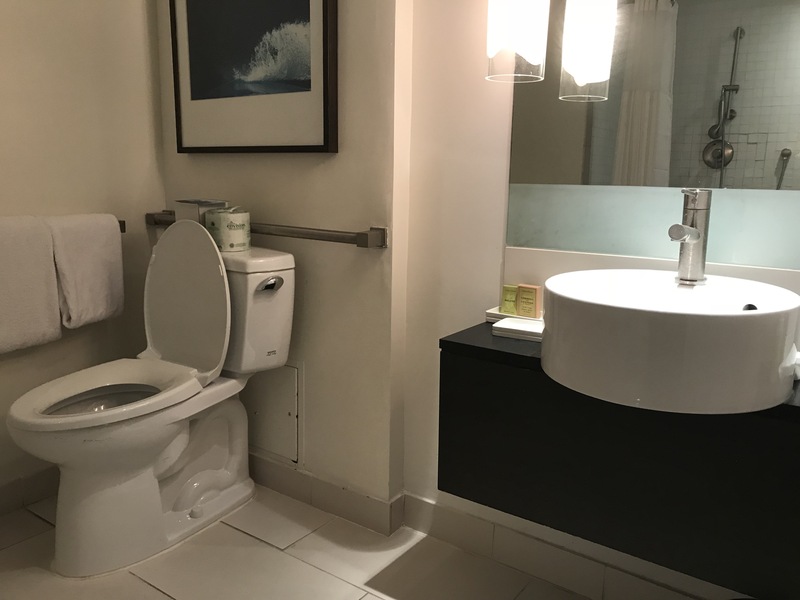 For the record, at the beginning of all of my hotel stays, as a professional courtesy, I always let the manager know that I am in accessible travel blogger and will be reviewing the accessibility of the property, for better or worse. The manager responded that I could make all the threats I wanted, but it would not change the situation. I explained to him that this was not a threat, it was part of my job. I asked him how I could file a complaint with Hilton management, and he said I should just fill out a survey at the end of my stay. He did not provide me with any contact information for Hilton customer service or Hilton corporate. After this conversation, I contacted the Special Assistance manager for my conference, who was able to elevate my complaint and work with a different Hilton manager. She brought a rollaway bed from another Hilton property in her personal vehicle to my hotel for me to sleep in. She even personally made the bed for me. I slept in the rollaway bed for my entire 5-night stay, and while I was able to sleep, I developed deep scratches on my elbows that bled from the springs in the mattress when I rolled over during the night. 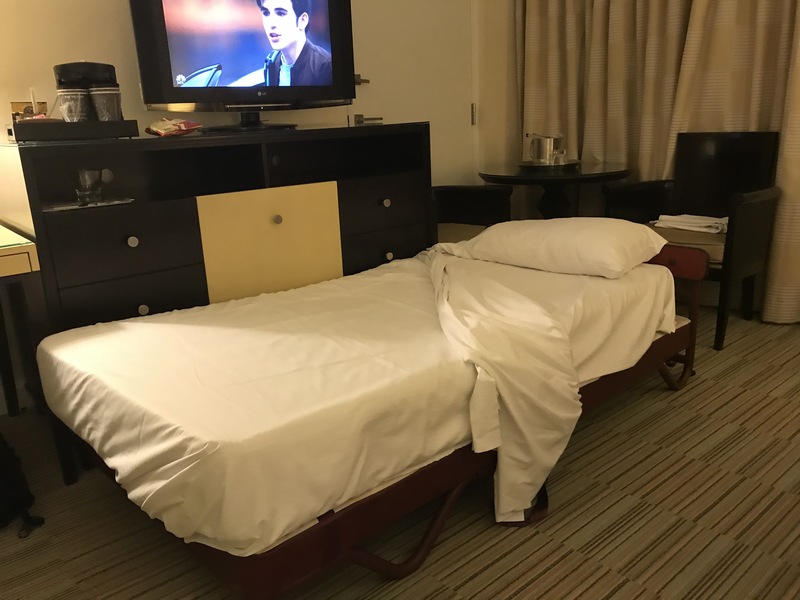 I was not offered any compensation at all by the hotel, and I had to pay the full rate of $200 a night (at a conference discount) despite the fact I spent my stay sleeping on a rollaway mattress that caused injury. I would not recommend the Hilton Fort Lauderdale Marina at all to wheelchair users.